“In the Master of this affair are present practices (Sunnah) of four prophets: Musa, Isa, Yusuf and Muhammad (S). Narrated to us Ahmad bin Ziyad Hamdani (r.a.) that he said: Narrated to us Ali bin Ibrahim bin Hashim from Muhammad bin Isa from Sulaiman bin Dawood from Abi Baseer from Abi Ja’far (a.s.) a similar tradition. 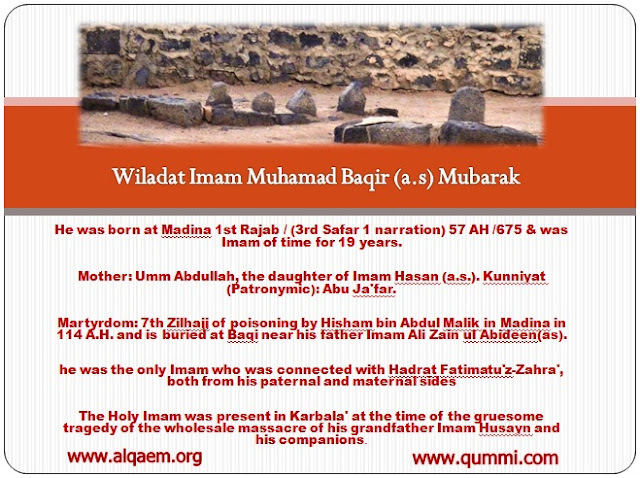 “I came to His Eminence, Abu Ja’far Muhammad bin Ali Baqir (a.s.) in order to ask him about the Qaim of Aale Muhammad. His Eminence himself initiated the matter and said: O Muhammad bin Muslim, in the Qaim of Ahlul Bayt of Muhammad (S) are present similarities to five prophets: Yunus bin Mata, Yusuf bin Yaqoob, Musa, Isa and Muhammad - peace be on them all. Similarity to Yunus bin Mata: Return from occultation as a young man though being advanced in age. Similarity to Yusuf bin Yaqoob: Occultation from the special people and general public and remaining concealed from the brothers and the becoming difficult of the matter on his father, Yaqoob inspite of the nearness of distance between him and his father, his family and his followers. Similarity to Musa: Always being in fear and the prolongation of occultation. Hidden birth and the exhaustion of his followers after him from the excessive torments and tribulations that they suffered till the Almighty Allah permitted him to appear and helped and assisted him against his enemies. “None responded to the call of the Messenger of Allah (S) before Ali Ibne Abi Talib (a.s.) and Lady Khadija (s.a.). The Messenger of Allah (S) remained in Mecca for three years (after declaring his mission) as he feared his community and other people.” It is a lengthy tradition, a part of which we have presented, as it pertains to the topic of our discussion. “In the master of this affair there is a similarity to Musa, to Isa, to Yusuf and Muhammad (S). As for the similarity to Musa: It is being fearful and watchful. And as for Isa, it is that it would be said about him what was said about Isa. And as for Yusuf it is the prison and the occultation. And as for Muhammad (S) it is rising with the sword and he will follow the style of His Eminence and expound his traditions. At that time he would carry his sword in his right hand for eight months and continuously go on eliminating his enemies till the Almighty Allah is satisfied. I asked, How do we know that the Almighty Allah is satisfied? “The Qaim from us will be aided by awe and helped with divine assistance. The earth will fold up for him and the treasures will be exposed for him. His dominions will be in the east and the west and through him will Allah, the Mighty and Sublime make His religion dominate over all religions even though the polytheists hate this. Then no ruin will remain in the earth but that he will restore it. And the spirit of Allah, Isa bin Maryam (a.s.) will come down and pray behind him. I said: O son of Allah’s Messenger, when will your Qaim appear? He replied: When the men will resemble women and women will resemble men. When men will satisfy their lusts with men and women with women. When women will ride horses. False testimony will be accepted and true testimony will be obstructed. Murder will be considered a minor thing. Adultery and usury will be common. People will fear the talks of the evil people. Sufyani will arise from Shaam and Yamani will appear from Yemen. This is the end of the first volume of Kamaaluddin wa Tamaamun Nima by Shaykh Faqih, Abi Ja’far Muhammad bin Ali bin Husain bin Musa bin Babawahy al-Qummi (r.a.), which proves the incidence of occultation and removes misunderstandings about it. The second volume begins with the chapter of narrations from Imam Ja’far Sadiq (a.s.) about the Nass in favor of the Qaim (a.s.).